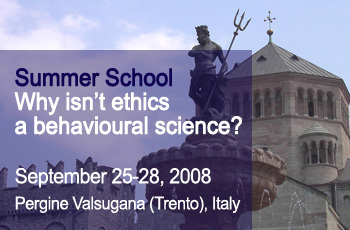 As in every summer, the Laboratory for Social Responsibility, Ethics and Rational Choice of the Department of Economics at the University of Trento, and Econometica (Inter-University Centre for Economic Ethics and Corporate Social Responsibility) organize a summer school on game theory, social norms and institutions. This year's summer school will continue on this tradition. Recent developments in behavioural economics have created the reasonable expectation that ethics and welfare economics might one day become part of a unified science of human behaviour encompassing economics, sociology and other social sciences. Three sides of the current research are likely to play a fundamental role in this process of integration. First, the theory of learning and evolution in games. Second, the more sophisticated approach to people’s preferences pioneered by behavioural economists, which incorporates altruism and spitefulness, a taste for reciprocity, feelings of guilt and shame and other moral emotions. Finally, the experimental research on the way in which flesh-and-bone individuals make their decisions in strategic situations. The organization of the summer school reflects this conviction. The first part will cover the economic and philosophical approach to the evolution of justice and social contract. In the second part the main behavioural models will be introduced. In the third part the experimental evidence will be presented. Implications of the current research for ethics and welfare economics will be addressed in the last day of the school.